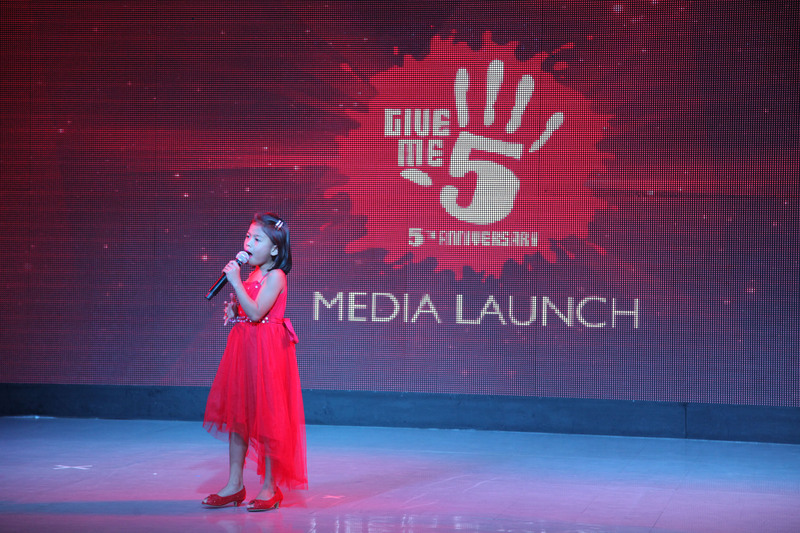 PASAY CITY, Philippines—The country’s first and largest integrated lifestyle and tourist destination—Resorts World Manila (RWM) just turned five years this month and it hosted an exclusive event, which formally launch its anniversary celebration dubbed as ‘Give Me 5’ on August 19, Taps, Genting Club. 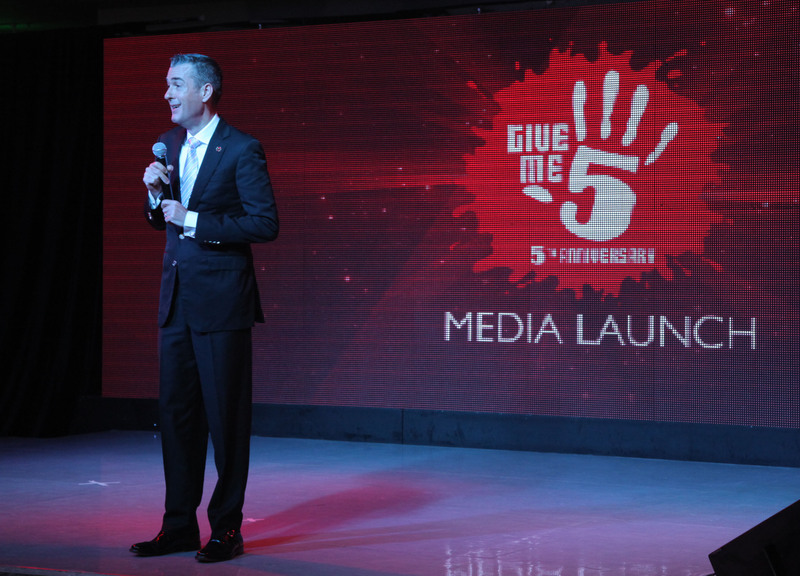 RWM’s chief operating officer Stephen Reilly greeted the guests during the unveiling of ‘Give Me 5’ event at TAPS Genting Club. Photograph courtesy of RWM. The said event served as a prelude to the grand kick-off on the 28th as it offers a look back at the company’s stellar five-year run, a glimpse of the anniversary festivities in store, and plenty of exciting activities and promos in an afternoon of pure thrill. RWM chief operating officer Stephen Reilly welcomed the guests. The guests were treated to a feast featuring five exquisite dishes from five of RWM’s signature restaurants, namely French restaurant Impressions; Korean-Japanese Ginzadon; Cantonese fine-dining Passion; coffee bar and lounge Café Maxims; and VVIP dining Happy 9. Apart from that, exciting activities and promos that the hotel-resort can offer, it also showcased the mesmerizing acts of the European acrobats—Duo Kvas. X Factor finalist Mark Mabasa and Friends (Lucky Robles, Lilibeth Garcia, and JV Decena) also performed a musical number that day. Two of the Voice of the Philippines finalists—Darryl Shy and crooner Paolo Onesa were also there to sing as well as the scene-stealer, the Voice of the Philippines Kids grand champion—Lyca Gairanod impressed the members of the audience with her song rendition. 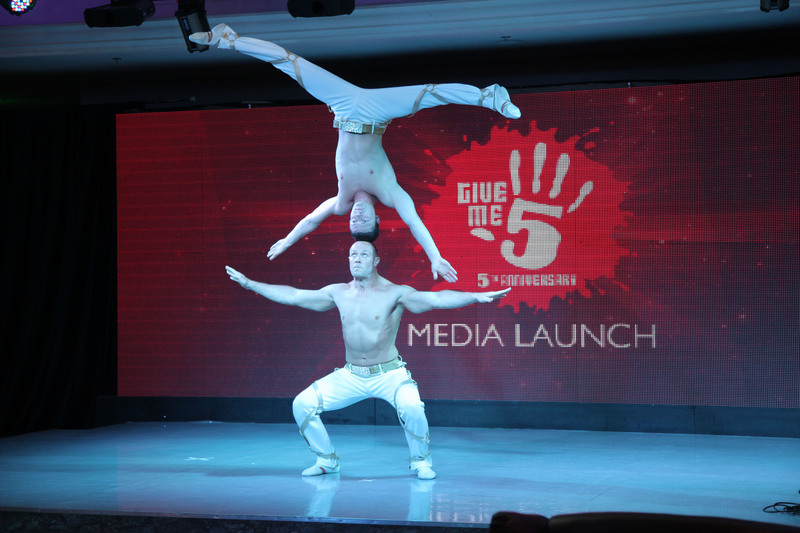 Guests’ jaws dropped while witnessing the mesmerizing acts of the European male acrobats ‘Duo Kvas’ during the ‘Give Me 5’ launch. Photograph courtesy of RWM. 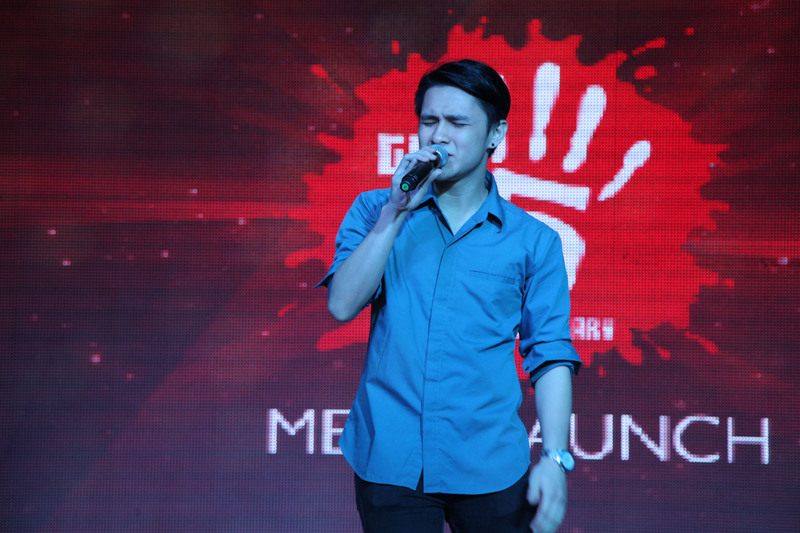 The Voice of the Philippines’ finalist and crooner Paolo Onesa serenaded the members of the audience. Photograph courtesy of RWM. But the highlight of the event was the appearance of The Voice of the Philippines- Kids grand champion Lyca Gairanod. Photograph courtesy of RWM. RWM is the first one-stop, nonstop entertainment and tourism destination in the Philippines that features exciting recreational thrills, outstanding performances, unique events, and spectacular lifestyle and leisure options. Conveniently located across Ninoy Aquino International Airport Terminal 3, RWM is an instant gateway to world-class Philippine hospitality. To know more about, log on to its official website. I also want to be a ‘TRIPPER’ like Them! I was privy to this upcoming travel show since its conception and I am as excited as anyone else to finally feast on the episodes of ‘TRIPPERS’. It is a weekly show that will take its viewers to places that they want to see for themselves, take the trip and experience what the hosts have experienced while taping the said show. None of the travel shows I have seen so far on local television that is like this one. It is NOT THE USUAL TRAVEL SHOW. It encourages the viewers to be actively involved in preserving our environment in order for us to appreciate further its grandeur. TRIPPERS will be airing every Sunday starting August 31, at 9:30am and will have its replay every Saturday at 3:30pm. It is also carried over by The Filipino Channel or TFC throughout North America, Japan and the rest of Asia Pacific. I also want to be a ‘TRIPPER’ like the hosts. Have Fun at Resorts World Manila’s Epic Summer Treats! PASAY CITY, Philippines – Resorts World Manila (RWM), the country’s ultimate celebration destination, launches its Epic Summer festival on Thursday, April 3 at Taps, Genting Club, Maxims Hotel. This year’s summer festival, which is themed after one of the most flamboyant and highly enjoyable theater productions staged in Australia, Broadway, and the West End, which started this month till June. It promises its regular and first-time partygoers with thrilling events, hot blockbuster movie premieres, exciting sports happenings, enticing promos, as well as family fun, and the biggest theater scene coming this May. Though, Mandopop Superstar Michael Wong and Maggie Chiang have kicked-off the summer parties via a one-night only concert—Michael’s ‘Crazy Memories’ tour at Newport Performing Arts Theater (NPAT) on April 5—that was just the beginning of its April Thrill. Also, last Sunday, April 13, viewing parties for the Pacquiao versus Bradley fight were held simultaneously at NPAT, Bar 360, Genting Club, and Newport Cinemas, too. On April 21, Easter Sunday, treat the kids to a special Esater egg hunt and performance by Wanlu and his puppets right after hearing High Mass at NPAT. Prince of Acoustic Pop, Nyoy Volante, will perform on April 22 at RWM’s Bar 360. And to complete the April Thrill, RWM’s Newport Cinemas in cooperation with AXN will premier ‘The Amazing Spider-Man 2’ on April 30. An exhibit of the film’s collectibles and memorabilia will be mounted at The Plaza of the Newport Mall. More Reasons to be Gay in May! In celebration of Star Wars Day on May 4, The Philippines’ 501st Legion commemorates the grand event at The Plaza with an exhibit of rare collectibles, toys, and more. It will run until May 11. Then the biggest theater spectacular is happening at NPAT, the staging of ‘Priscilla, Queen of the Desert’ with leads Leo Valdez as Tick a.k.a. Mitzi, Jon Santos as Bernadette, and Red Concepcion as Adam a.k.a. Felicia. The show opens on May 9. Of course, the Mother’s Day celebration that month will be observed. Expect something in store for all the moms dropping by The Plaza that day. On May 10, a cat show for the feline lover will feature cat whisperer Mieshelle Nagegschneider. Following this month’s reasons to be gay is the performance of the legendary all-male band Hagibis on May 20. They will bring back their guests down the memory lane and perform their hits. While on May 31, all cosplayers will gather for the launch of TOYCON 2014. There’ll be loads of toys for sale as well as unique and perhaps never-been-seen collectibles on display, too. Since its Summer Epic Fest is nearing to an end, RWM stretched more fun while the summer sun is not yet gone. Capping off the summer entertainment spree, US Alt rockers—Vertical Horizon will have a one-night only concert on June 5 at NPAT, featuring their latest album—‘Echoes from the Underground’ as well as some of their hits—‘You’re a God’, ‘Everything You Want’, ‘Best I Ever Had’, and more. A great way to celebrate Philippine Independence on June 12 is by witnessing the 100 Years of Philippine Sports Awards Night at the NPAT. Just like Mother’s Day, it’s the turn for fathers to celebrate Father’s Day in June. There will be a special treat as well at The Plaza for all the fathers. And perhaps a better way to celebrate a post-Father’s Day is via Bar 360’s show that will feature the father-and-daughter tandem of Hajji Alejandro and Rachel Alejandro as they sing the best of both past and present Pinoy pop on June 17. All these are just some of the highlights for RWM’s Summer Epic Festival. For calendar of events, click here. For further details, visit its official website RWManila.com or call Tourist/Visitor Hotline at (632) 908-8833.